A Is For… ARE YOU WITH IT? (1945) | THAT'S ENTERTAINMENT! UnsungMusicalsCo.Inc gave the show a rare reading in December of 2013 at the NYPL. To my knowledge, this is the first time the show has ever been seen since its closing in 1946. Thanks to the NYPL, you can read more about the show here, along with a reconstruction of the script. Original cast member Joan Roberts recorded two numbers. Above is the main couple — Wilbur and Vivian’s — second duet, “This Is My Beloved,” as sung by Roberts. June Richmond, Cleo of the original cast, recording two numbers, only one of which she actually sang in the show. Unfortunately, I do not have these rare recordings. (If you have them and would like to share, contact me so we can update this post!) One of her songs was “Just Beyond The Rainbow,” which you can hear above as sung in the December 2013 reading. Here are two never-before-recorded songs, both from the December 2013 reading. Above is “When A Good Man Takes To Drink,” sung by Vivian, the Policeman, and the Bartender. Below is “Send Us Back To The Kitchen,” sung by Marge Keller, the heroine’s best friend. 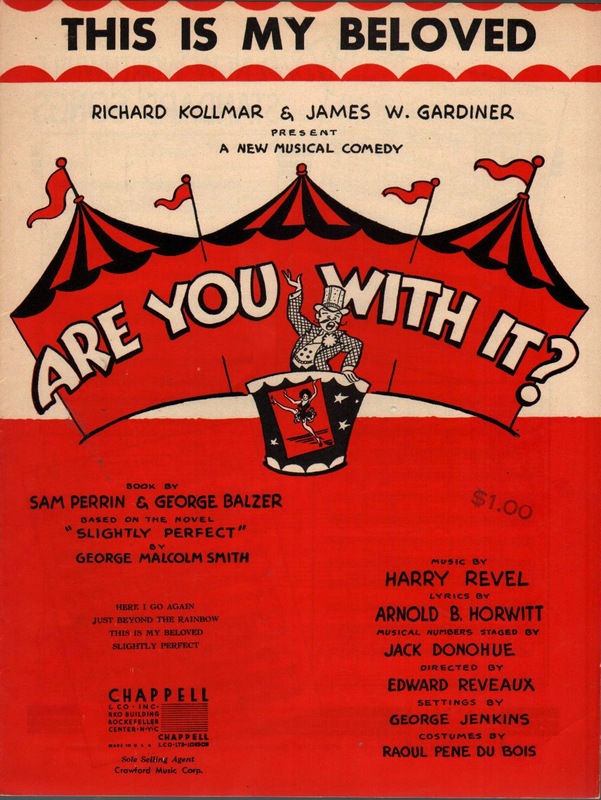 My favorite song from the score is Wilbur and Vivian’s first duet, “Slightly Perfect” (later reprised by those midgets I mentioned earlier, under the title “Slightly Slightly”). This recording is by Rebecca Luker and Greg MacKellan. And, lastly, here’s the raucous title song! Come back next Monday for B! And tune in tomorrow for the best from Season Two of Here’s Lucy!